As Kenya’s middle class potential grows and yearns for convenience, smart and efficient gadgets Samsung has responded by enriching the home experience by manufacturing several home appliances that seek to enrich the home experience. From smart television to smart fridges, microwaves and even security system, the company has once again reiterated on home appliances by introducing the Activ dual washing machine, a first of its kind with a built-in sink. Today, Kenyans have become more aware of what they need and the comfort of the activ dual washing machine is targeted at changing the laundry experience into a more exciting activity for the working class. Kenya’s middle class, estimated by the African Development Bank at 44.9 per cent, poses a great opportunity for the fast growth of industries such as real estate and consumer electronics. The middle class is greatly driven by a desire to achieve happiness through purchase of gadgets and home appliances. According to 2013 Global Consumer Sentiment Report, between 60-90 per cent of African consumers are willing to spend more on durable goods such as cars and home appliances than on perishable goods. The Samsung Active dual washing machine’s includes a sink, which provides a convenient and unique space to hand-wash delicate items and pre-wash heavily soiled clothes. Especially as it includes a built-in water jet on the side, which can be started and stopped with the press of a button. And any water leftover can then be used for washing clothes in the drum below. The Samsung WA4500HH washing machine’s innovative Wobble technology protects delicate fabrics from friction damage without compromising the washing performance. The unique structure of its Wobble pulsa-tors generates a dynamic, multi-directional washing flow that prevents tangles, twists and knots and thoroughly cleans clothes. And its increased washing power also leads to less water consumption. The Samsung WA4500HH washing machine’s lid is designed to open and close smoothly and silently, so there are no unexpected bangs! It also features a tempered glass window, so you can easily view your washing without lifting the lid. And it’s also extremely durable and resistant to scratches and damage, so it will last a long time. 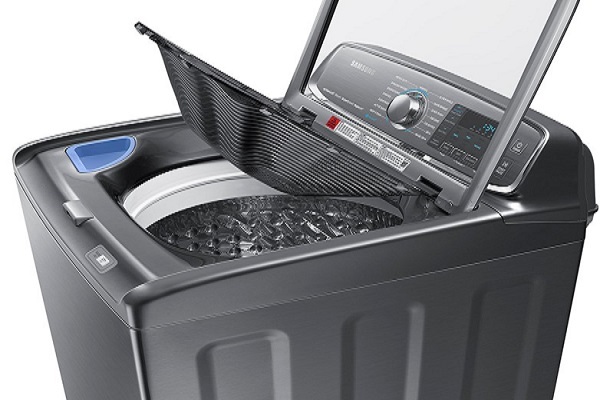 The Samsung WA4500HH washing machine’s Diamond Drum features a unique design that treats clothes with more care than a conventional drum. Its smooth, diamond-shaped ridges are supremely gentle on even the most delicate items, while its small water exit holes also prevent fabric from becoming trapped and damaged. So your clothes stay looking good. Normally, the most tedious task is pre-wash where clothes are soaked and scrubbed in the washing area then transferred to the washing machine in another location. Understanding this, Samsung came up with a revolutionary washing machine which cares for the homemaker as well as the clothes. Samsung ActivDual Wash has a in-built sink with water jet and a gentle scrubbing surface. This allows user to handle the entire wash process in the washing machine instead of spreading to multiple location hence avoiding mess, reducing effort and saving time. Imagine a regular top-load washing machine, but with a sink on top of it. With a press of a button, water will be channeled into the basin-like space just like a sink! Instead of squatting down with a basin, you can now stand up to hand-wash delicate items or pre-wash stain on dirty clothes. The basin’s corrugated surface is made to mimic a washing board. It means you can gently scrub clothes directly on the surface. You can forget about using those colorful and spiky plastic scrub brushes. Samsung created Wobble technology generates a ‘dynamic, multi-directional washing flow that prevents tangles, twists and knots and thoroughly cleans clothes’. This means less tangle, twist and knots means less crumbly clothes and you might even escape the time-consuming ironing. Nowadays no one refers to paper manuals anymore. The Smart Check automatic error-monitoring system detects and diagnoses problems using smartphone app.